Ready to go backpacking in Europe, go snowboarding on Black Diamond, beach hopping in Thailand or have a business meeting in NYC? Whatever your travel purpose is, at the end of the day, you want your body and mind to be FULLY RESTED for the next exciting day! That boils down to one question – where are you going to stay? We say, be smart on this decision because accommodation is a CRUCIAL aspect for having a good travel experience or a bad one. Like I mentioned in some of our travel tips, we have tried Airbnb and Agoda for hotel booking and we would like to compare our accommodation options between these two sites. After constantly having good experiences in a row for the last 10+ bookings with Agoda in less than a year, it has become our first choice whenever we plan our travels, and we are only the 2 satisfied customers out of 7,000,000. Based on our own experiences, we have thoroughly enjoyed the benefits by having an account with Agoda and booking from them. Here is what we love about it and we think you might like it too. Really competitive price with a best price guarantee policy. 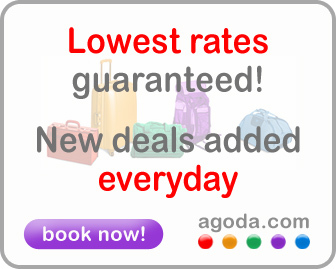 Basically, if you have reserved a hotel room through Agoda and then show them that you could book the same room for the same dates at a lower rate that is viewable and bookable on another website, Agoda will either match that rate or beat it. They are serious about being cheap! Offer reward points on each booking and you can redeem them at your next booking or save them up for some free nights. We collected a good amount of points and redeemed them all at once for our Thailand trip, it saved us a lot of money! They offer a worldwide range of hotel selections up to 285,000 hotels in 37,000 cities from hostels to 5-star hotels with millions of customer reviews. It’s easy to make a decision based on these authentic customer reviews! You will receive extra 500 points by writing a hotel review. Points equal to moneys. Agoda confirmation letter prints your hotel name and address in local language. When our Thai taxi driver was having problem to understand my English, we directly showed him the confirmation letter and problem solved! Simply click the image above and type in your destination, check-in date and choose how many nights you would like to stay in the left form on your screen and then click the big blue “Check rates!” button, Agoda will show you a whole list of hotels with best deals! If you like what you see, create an account from there and go ahead book a room. P.S. The links on this page are affiliate links. In other words, if you do successfully reserve a hotel without cancellation through these links, we will receive a small amount of funds as commission from Agoda. In that case, please allow us to say thank you for your support to Worldly Travelers Guide in advance!